A few hours after the celebratory atmosphere that surrounded the visit from Pope Francis, President Obama welcomed Chinese President Xi Jinping to the White House to tackle a much thornier set of issues ranging from cybersecurity to China's island-building in the South China Sea. When the two met at the Asia-Pacific Economic Cooperation summit in Beijing last November, they were able to forge a historic agreement to reduce greenhouse gases. And during this visit, Obama administration officials say that Xi will announce a nationwide cap-and-trade system, beginning in 2017, according to the Associated Press. The Chinese will also offer financial help to poor nations to help them move on to less polluting technologies, too. Climate change is "still a big issue" for both the U.S. and China, and we have "very similar interests" Adam Segal, a China and cyberspace expert at the Council on Foreign Relations, told CBS News. Part of the impetus for China's action is the heavy toll pollution has taken on its agriculture and the health of its people, not to mention the smog that blankets its major cities. But then our common interests diverge. "I think we've run out of issues in some ways," Segal said. "Cyber and the South China Sea, human rights - all of those are areas where we really have a difficult time identifying shared interests...What both sides are hoping for is a tamping or dampening down of tensions and discussions." A New York Times article last week by David Sanger suggested that China and the U.S. were negotiating an agreement in which both countries would pledge not to attack each others' critical infrastructure like banking systems, cell phone networks and hospitals during peacetime. But administration officials soon tried to manage expectations after the article was published. "I don't want to suggest that we reached an arms control agreement here," Ben Rhodes, the deputy national security adviser for strategic communications, told reporters earlier this week. In addition to the protection of critical infrastructure, Rhodes stressed that any agreement would have to encompass cyber theft, which has been a source of tension with the Chinese. "The goal here is we start from a common understanding that you have agreed-upon principles which we believe must include that cyber theft does not go forward," he said. "And then as the two largest economies in the world, I think we can lead an effort to develop international norms that govern cyber activity." 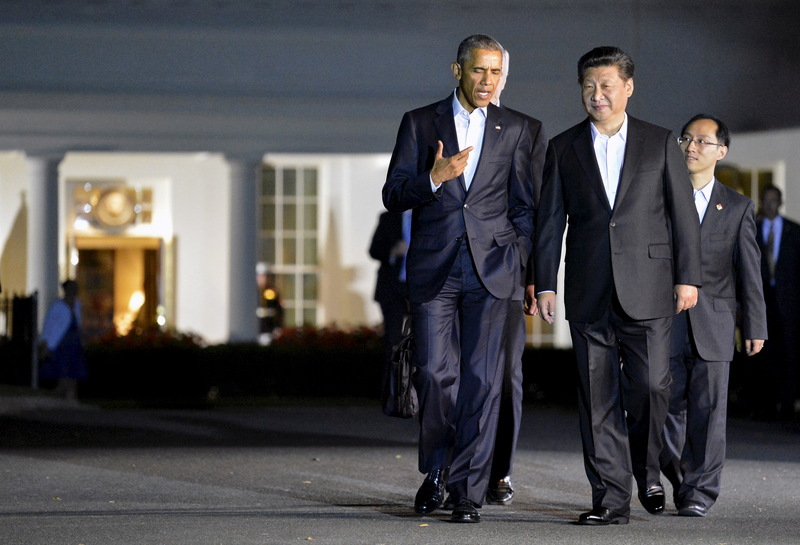 What's on the menu for the State Dinner with China's Xi Jinping? Segal said that the U.S. and China had already agreed not to attack each other's critical infrastructure during peacetime in a United Nations agreement last June. But there are problems with the agreement, the main one being that "infrastructure" lacks a common definition. "It's not clear what critical infrastructure means. Countries could define it differently and it's almost impossible to verify," Segal said. "There's no way to figure out if the other side is not doing what it says it's not doing." James Andrew Lewis, who runs the Strategic Technologies Program at the Center for Strategic and International Studies (CSIS), wrote, "If there is no reference to cyber espionage and no process to work on it, any summit agreement has not addressed the most important source of tension between the two countries," which goes to be the point that Rhodes was making. Cyber espionage - the kind that led to the massive hacks of Sony Pictures and the Office of Personnel Management last year - remains a major source of tension between the two countries. And that wouldn't be addressed by the cyber agreement that Sanger outlined in the Times story. "Since very early on in the Obama administration, the president has tried to persuade the Chinese of the distinction between use of cyber for stealing intellectual property and for traditional espionage purposes, and this is something that the Chinese have not accepted," Bonnie Glaser, a senior adviser for Asia at CSIS, told reporters earlier this week. Without any agreements with China, the U.S. is likely to keep sanctions against its counterpart on the table as a possible response to future cyber hacking. "Hard to predict at this point whether they will be imposed," Glaser said.